First of all, I’d like to wish you a happy new year and I hope 2018 is a peaceful year full of health, happiness and creative fun for you all! I was pretty pleased how they turned out so I cured them and added a back including polymer clay bails to hold a chain or cord. Then I realised that I had gold and silver leaf on the surface and would need to protect it. 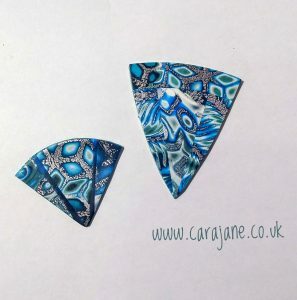 I bought an excellent tutorial from Debbie Crothers about curing liquid polymer clay last year that I had experimented with a little but hadn’t mastered. So I decided it would be a good time to go over the tutorial again and play a bit. I practised a bit on some old beads but my heat gun (well my husbands heat gun really) has variable settings and I was having a bit of trouble working out the best setting. Time for a bit of science! How hot is the heat gun on each of the setting marks? What’s the maximum and minimum temperature of the air it blows out? How does the heat vary as you get further from the nozzle? 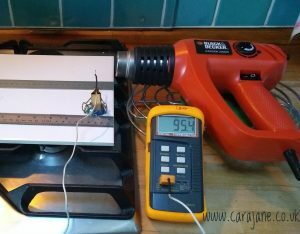 I used a thermocouple probe held in a bulldog clip to record the temperature (I use these types of thermometers to check the temperature in the oven when curing polymer clay). First of all, I used the heat gun on the middle setting and set up the thermocouple touching the nozzle and then moved it further away at 1cm intervals. I realised the gun took a while to reach a steady temperature so I recorded the temperature once the steady temperature was reached – this took about 2 minutes. Even then the temperature wasn’t static – just like an oven it fluctuates a little as the heating element doesn’t respond instantly. The temperature cycled by about + or – 5oC from the temperature I recorded. Here are the results. Quite a difference from 0cm to 10cm distance! Next I set the thermocouple probe up 50mm away from the nozzle and measured how the temperature varied when moving the setting dial. There aren’t actually fixed settings but the dial has a line with division markings on so I used these as the ‘setting’ points. I’m working with Kato Polyclay which cures at 150oC and the Clear Kato Liquid Polyclay which cures at 135oC according to the packaging. So the heat gun on max about 5cm away from my piece is pretty much double the official cure temperature! And on the low setting isn’t hot enough to do much. Once I understood the heat gun better I worked out how to use my particular heat gun to get the amazing clear shiny finish you can get from properly treated liquid clay (check out Debbie’s tutorial if you haven’t already!). I found working with the heat gun between setting 2 and 3 worked best for me. I was ready to tackle my new pendants. 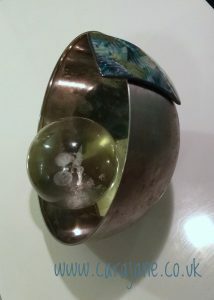 I hadn’t thought about it but my pendants were domed pendants that had been cured on a metal bowl and have a polymer clay bail on the back. As I was curing the liquid clay with the heat gun (Debbie’s tutorial was packed with information and tips and made this process much easier!) I realised that the pendants had got hot and were sagging, losing their shape. Worse still the bail on the back had been squashed flat and closed up. 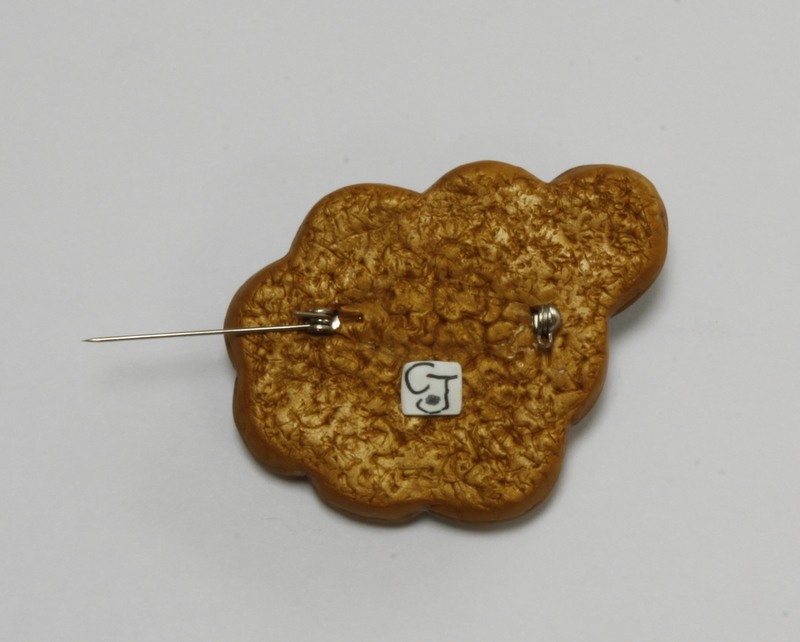 Debbie dealt with beads and cabochons and many other things in her tutorial but domed pendants with a polymer bail on the back wasn’t something that came up. 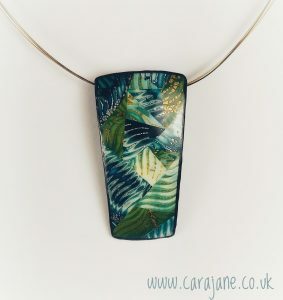 I’m afraid I didn’t take photographs at this stage – I was too concerned with not ruining my pendants! 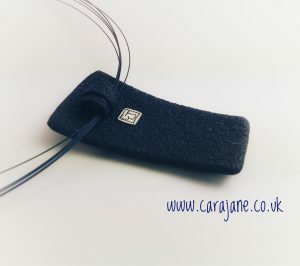 I heated the pendants with the heat gun again and whilst the polymer was pliable I was able to push the double ended knitting needle I had formed the bail around back into the bail so that you could fit a cord through again! I also managed to recover most of the shape using the inside of the metal bowl I cured them on originally (I used the outside in the initial curing but now I had a bail on the back so couldn’t use the outside). I was pleased to note that the contact with the metal didn’t ruin the liquid clay surface even though I placed them in the bowl when they were still warm. 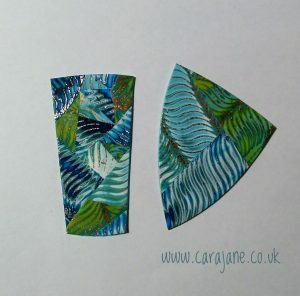 Phew, pendants recovered! But I still needed to finalise the liquid clay finish. I found I was able to support the pendants loosely on the outside of the bowl whilst curing the liquid clay to avoid further damage with the next layers of liquid clay. I used a paperweight inside the bowl to keep it on it’s side. 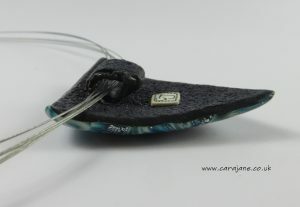 For the smaller pendant I supported it on a wet cloth (wet to avoid the cloth burning). I played about with the surface finish and made some pieces super glossy and some more matt. I don’t often need to protect a surface but I am glad I now have a technique I can use when I do. 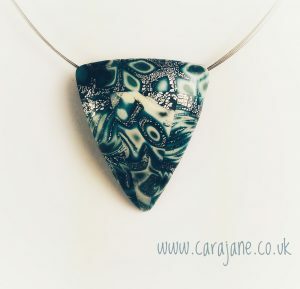 And of course now I have learnt this lesson the hard way I came up with a solution for future pieces – apply the liquid clay to the piece whilst it is still on the curved form! Seems obvious now! This supports the piece and there is no distortion of the shape. 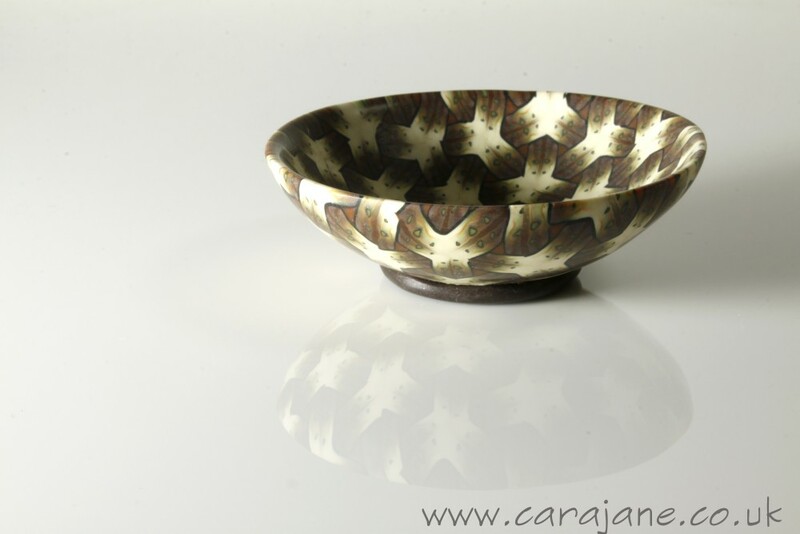 The metal bowl did change the curing a little as the metal heats up which means the piece gets hot more quickly. Then once I had a beautiful glossy finish and it had cooled I was able to add the back and the bail and then cure it again – no problems! I’m really pleased with how these pieces turned out so I think I will make some more. Over the last few years I haven’t been posting very regularly here on my blog or on Facebook, Instagram or Flickr. This year I’d like to get back to making more and sharing some photos so hopefully this will be the first of many blog posts for 2018! Testing Superglue -polymer brooch backs New Polymer Clay Ring Bowls Image transfer onto polymer clay – experiments From Polymer To Art – Purple – I’m in it! 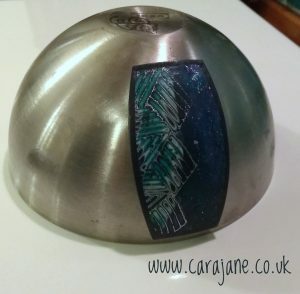 This is a really useful piece Cara Jane….thanks for taking the time to share! Thanks Cara, I too have used Debbie’s tutorial and it isn’t very good. 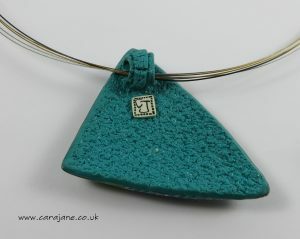 Love these patchwork pendants and thank you for the useful information. Presume that’s a typo and you mean it is very good? Great article, thanks Cara. I have Debbie’s tutorial and it is very thorough and packed full of useful tips. I must revisit it too and guve it a go. Thanks fkr testing the heat gun. That gives me a head start! Very clear and concise info here-many thanks. I studied Debbie Crothers terrific tutorial also, your blog adds wonderful details.